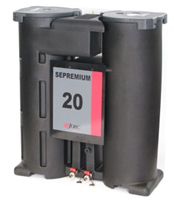 The SEPREMIUM range of oil/water separators separates oil from condensate, generated by compressed air systems. The SEPREMIUM achieves separation of oil from condensate by means of directing the condensate through various separation stages. As condensate flows in to the SEPREMIUM, the oil is filtered out through various filtration elements. The first oil adsorbing element has a clever saturation indicating feature, offering you a visual operating status of the separator at a distance. The elements are designed to combine various types of adsorption technologies to achieve less than 10 ppm oil residue values at the output stage. Final separation stage includes specially selected activated carbon to polish out the remaining contaminants.